as most of you know, about 6 months ago we moved into a new home. it's new for us, but so familiar too, as it is the childhood home of simona and me. our parents built an annexe, so now it's a few generations in seperate living quarters, but sharing a lot of space and time as well. it's an aspect of our new home i love. i wouldn't mind having my grandmother with us as well. or simona and her husband, in fact! i have to admit the decorating part of this transition took a lot longer than i had imagined. there was just so much renovating work to do, so that for a long time i was content with just the basics being done. i concentrated on the kids' rooms and the living room first. walls were painted, art was put up. it's still not 100% as i would like it to be. and especially the children's rooms are bound to be re-arranged in the years to come, as their preferences and tastes develop. i also know that if i wait for everything to be pinterest perfect, i will never share. so here we go, a mini-series of sorts, sharing a room and a corner at a time. with a few ideas and resources. let's start with a corner in the living room: the children's bookshelves. we have a lovely wall of books in our living room, with still plenty of space for our collection to grow (making this addicted-to-buying-books girl very happy!) two of the lower shelves are reserved for the children. one side for the junebug, the other for the little man. i try to re-arrange the books regularly, placing different ones in the front the the children to explore. we also always bring plenty of books from the library to have a bit of variety. we've had one armchair for a long time, and the kids have been sharing it. we now got a second one so that they can both cozy up with a book. both armchairs are from ikea. next week i'll be sharing the junebug's room (of which you can see a little sneak peek in the first picture). What a beautiful little nook to curl up in with a book...I am sure your kiddos love it! I would love to add on to my home and have my children and their families move in, that is a fantastic idea. There can never be too many books shelves and I love the little nook for reading. 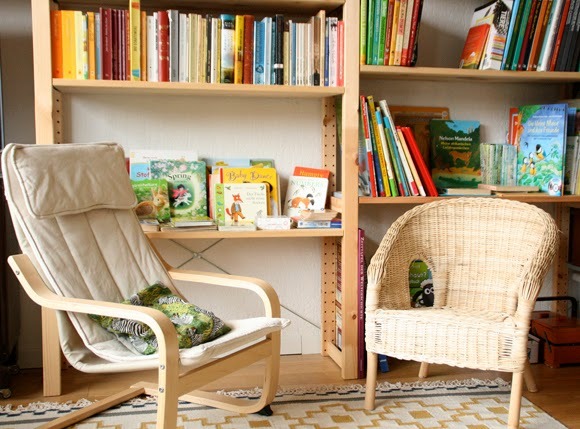 love the bright cheerful reading space you have carved out for you and the kids! it looks so cozy! can't wait to see it in real life. and for now, can't wait to see more photos! So sweet, the chairs there :) I wish I had more room for the books I can't help buying!